Maria-Paula joined The Trust in December 2011. 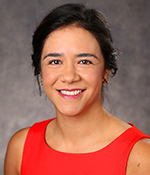 Previously she lived and worked in New York City where she evaluated early-intervention programs with the NYU Child and Family Policy Center and collaborated with the NYU Center for Research on Culture, Development and Education on a longitudinal study of multi-ethnic low-income families. Additionally, Ms. Garcia served at various organizations (HELP USA, Leake & Watts Services) assessing and counseling victims of domestic violence and adolescents with behavioral and psychological problems. Prior to moving to New York in 2005, Maria-Paula worked with abused and neglected children placed in foster care in Bogota, Colombia. Ms. García earned a M.A. degree (Human Development and Social Intervention) from New York University and a M.S. degree (Psychology) from the Pontificia Universidad Javeriana (Bogota, Colombia).